We conducted an in situ decomposition experiment to better understand how habitat nutrient content controls aquatic plant decomposition and, more precisely, to determine the relative importance of the wetland conditions in decomposition, and the intrinsic degradability of plant tissues. We collected the green leaves of three aquatic plant species with contrasting plant strategies from three wetlands of differing nutrient contents, and allowed them to decompose in seven wetlands along a nutrient gradient. 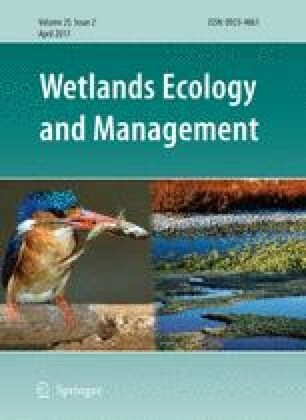 The plant mass loss was higher for competitive and ruderal species collected in nutrient richer wetlands as well as when they were led to decompose in nutrient richer wetlands. Plant water content correlated with mass loss for the competitive and ruderal species, which may explain the increase in mass loss with increasing nutrient content in the collection wetlands. Litter decomposition rate may be enhanced by wetland eutrophication, because of both the modification of wetland decomposition conditions and by changes in plant tissue quality. The online version of this article (doi: 10.1007/s11273-016-9510-2) contains supplementary material, which is available to authorized users. This study was funded by the French Ministry of Research and the French Water Agency (Agence de l’Eau Rhône Mediterranée Corse), and was performed under the aegis of the French LTER “Zone Atelier Bassin du Rhône”.